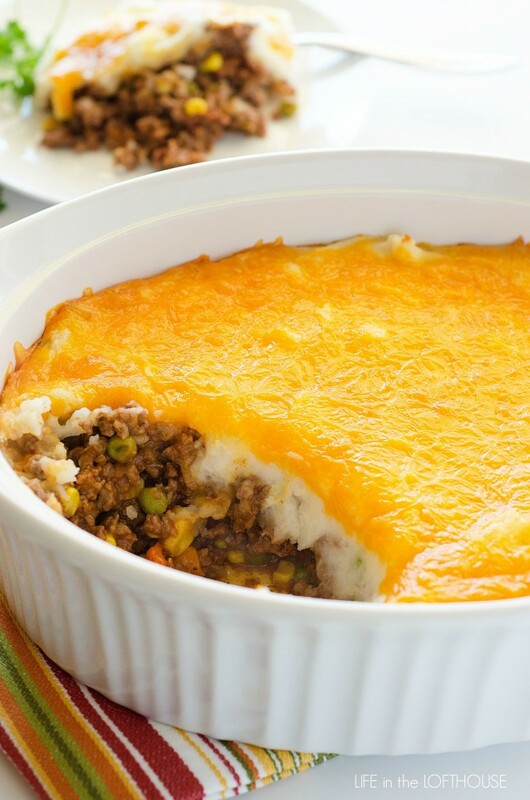 This classic Shepherd's Pie will have everyone asking for seconds. The meat mixture is so flavorful and the creamy mashed potatoes and cheese make it extra delicious. Drain water from pot. Mash the potatoes. Add butter, milk and garlic powder. Continue to mash until no lumps remain. Cover potatoes and set aside. Preheat oven to 375° F. Grease a 9x13 inch baking dish with non-stick spray. FOR MEAT LAYER: In a large 12-inch skillet, over medium-high heat, add ground beef,onion, garlic, salt and pepper. Cook and crumble meat until browned. Drain grease. Sprinkle flour evenly over meat mixture. Stir and cook 1 minute. Stir in tomato paste, broth, Worcestershire sauce and oregano. Bring to a boil, then reduce heat to medium-low. Stir in frozen peas, carrots and corn. Cook another 5 to 10 minutes or until heated through. Pour meat mixture into prepared pan. Spread mashed potatoes evenly over the top. Top potatoes with cheddar cheese. Bake, uncovered, for 35 minutes until casserole is hot and bubbly. Remove from oven and let stand 10 minutes before serving.